Planning your wedding is exciting and fun, but it can also be stressful. Planning for your big day is full of so many decisions it can make your head spin. One way you can lift a little of that stress is to make the process easier by keeping all of your important information in one safe place, so nothing gets lost in the shuffle of wedding planning. A big part of your wedding day will be the guests that you will invite to share in your special day. Keeping track of who will be there and who won’t can get stressful and overwhelming. Sending out an RSVP has been a great way to cut down on the frustration but can also add to the cost of planning a wedding when it comes to paying for one more thing to send out, not to mention the rising cost of stamps. The new and improved solution that has become popular in the last decade is going through an RSVP website. Many of these websites can be used for anything from a wedding planning aid to a site to organize and manage your guests’ RSVPs. Here are a few of the websites out there that can help you stay organized on your special day. My Invite List is our very own Free online app that you can use to collect guest addresses and set up an RSVP accessible by your guests. Share with your friends and family your personalized form link on social media sites, email, and text. Make it easy for your guests to give you all their information. What is unique about our system is that once you are ready to address your envelopes you can simply download your list in a .TXT, .CSV, or .XLS format and print on your labels or envelopes. Check it out! When you sign up for The Knot, you will several personalized planning tools available to you. You can create your own custom website to share with family and friends. You will have access to a personal planning expert 24/7. It will keep you organized so you always know what to do, when. Your wedding registries will be all in one place and you will be able to personalize a wedding spending plan based on your budget. We of course can not forget the main reason for this post; you can also keep track of guests, RSVPs, and thank you notes. 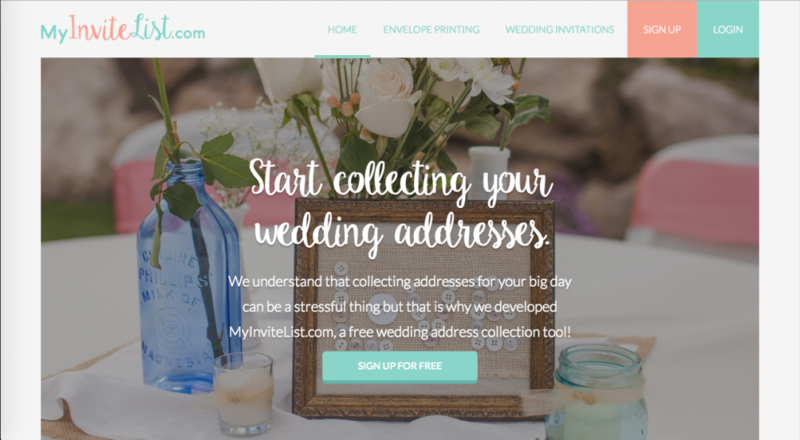 This is another great website that will make RSVP’s ten times easier. One unique quality of the site Appy Couple is that it’s an app that is built for your mobile device in addition to the desktop website. Sometimes a great website comes with a price though. To build your own personal app and website it costs $35 but for guests, downloading and using this app costs nothing. If you are willing to pay the $35 it may be worth the stress you will save yourself by having to keep track of everything yourself. This is another service that costs nothing and helps with the management of your wedding. This site is interactive for you and your guests. Once you sign up, you can either import a guest list from another file or you can choose the “open” option, meaning that your guests can add themselves to the list. This is another free site and it is simple to use. If all you want is a straightforward RSVP website without all the bells and whistles, this is the website for you. You will have the ability to customize your RSVP form. You will also be able to send out reminder e-mails to your guests, so they won’t forget your big day. Wedding Wire is great because it doesn’t charge a fee and its website offers all your wedding planning tools is one place. This is perfect for the bride-to-be who is on the go and needs to have a digital book of her wedding details. When you use their RSVP feature, you can import your contacts from your Gmail account making it easier to build your guest list. You can create a custom website for guests to see when they choose to RSVP. You will be able to keep track of who has declined and who hasn’t respond yet. This is a simple website and the best part about this website is that no personal information is needed when registering and you can create an unlimited guest list. You can send an invitation by e-mail and track the responses through regular updates this site provides for you. Invite Spring is a site that is free to get started and then once you decide to activate your event, it will cost only $10 per event. This includes an unlimited number of guests, support, and a lot of management tools. You will also be able to share your event’s RSVP website through a url or a QR code. These are all great websites that will definitely keep you organized as you plan your big day. Any of these websites are a great option if you would like to steer away from the traditional RSVP card you send out to your guest. Just include the RSVP site link on your wedding invite and let your guests do the work from there. As an added bonus they may even be able to find out all about the happy couple through your own personalized wedding story you can include on many of these websites. Whatever you choose, your wedding day will be amazing! Happy planning!